See the stairs in the back (behind the flowers)? These were part of Mary’s home. The reason this room looks kind of like a cave is because the land is full of hillsides with caves, and many of the people built their homes out of these. 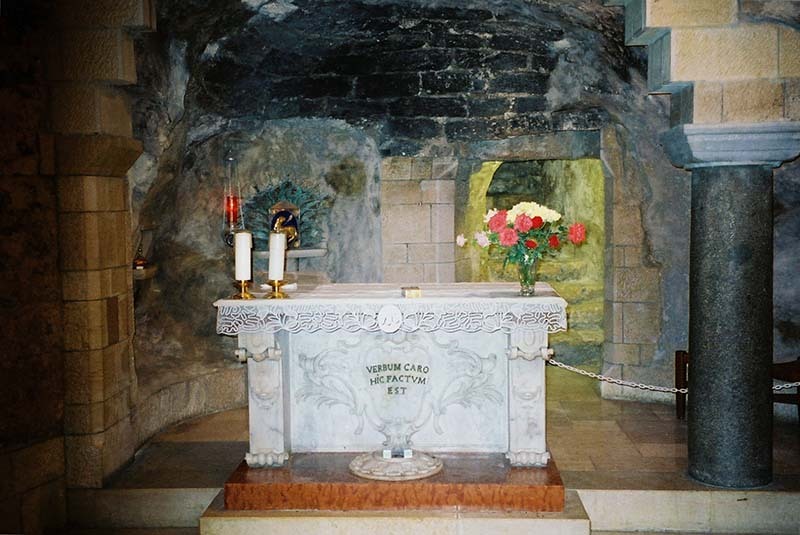 As our group gathered in the sanctuary built in front of the grotto to pray a Litany of Mary and give glory to God, at 5:25, the church bells started ringing. That was an odd time to ring! Why then? They did not stop, so we proceeded to pray with the ringing as our dramatic accompaniment. As the bells rang and rang and rang, it seemed to me that Heaven was rejoicing. As we prayed, “Mary, model of strength, model of gentleness, model of trust, be our guide …” a new awareness grew within me. It felt like the Blessed Mother herself was inviting me to make a firm commitment ~ give my YES! ~ to God’s call to be His servant in ministry more than ever before. It was my own moment of Annunciation, my own Fiat! It filled me so completely, I overflowed with the experience (it would turn out to be the most powerful moment of the whole pilgrimage for me) and tears streamed from my eyes. I wanted to leave the place because it was the only way I could recompose myself, and yet I also wanted to remain in this special place and in this special moment with God forever. Pray this with me: Oh Lord, help me to say “yes!” to whatever it is You are calling me to do. I want to serve You and make Jesus’ love more evident in the world around me. Amen!